Mark Permanently with Real Paint Pens! plastic, leather, stone, wood, metal, paper, etc. Opaque, weatherproof, dries to a glossy finish in seconds. Smooth application with the pressure sensitive felt tip. 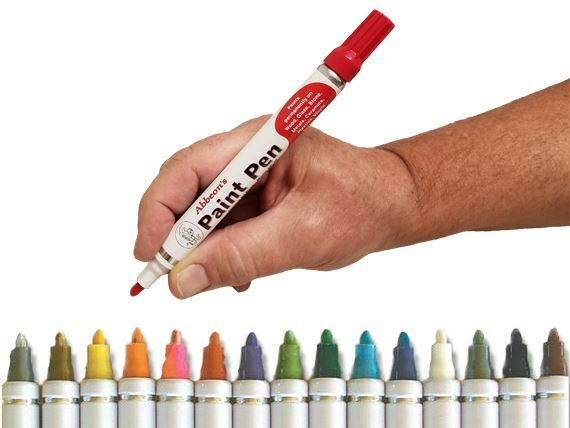 Pen-size for convenient handling shake for 60 seconds to insure proper mix of paint. Writeout 150 meters. Size is 5 3/8" long x 5/8" diameter. Minimum order is 15, please call us to mix and match colors 800-922-0977.